"Saturday Night Live" returned for its 43rd season by lampooning President Donald Trump's response to the disaster in Puerto Rico after Hurricane Maria and his feud with NFL players who protest during the national anthem. 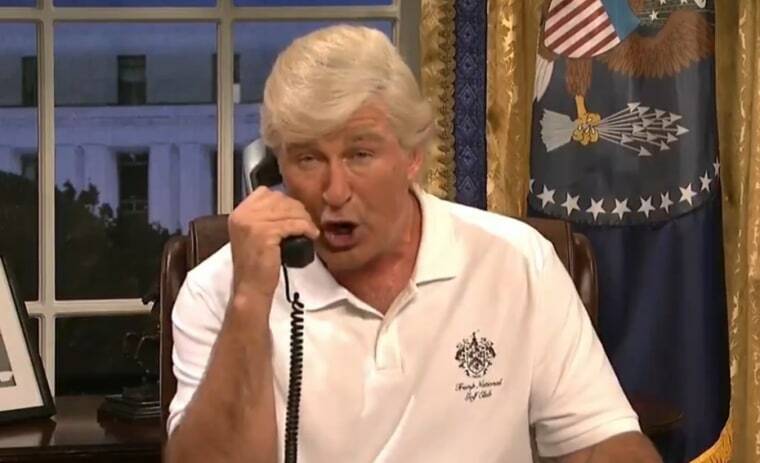 Alec Baldwin reprised his Emmy-winning role of Trump, and the cold open began with the president returning to the White House after a weekend golfing at Trump National Golf Club in Bedminster, New Jersey. Baldwin's Trump is greeted by Aidy Bryant as White House Press Secretary Sarah Huckabee Sanders. "Welcome back from Bedminster, mister president," she says. "Thank you Sarah, I had to come back — sometimes when you're president you have to make sacrifices, so I skipped the back nine," Baldwin’s Trump responds. Bryant's Sanders then informs Baldwin’s Trump that the mayor of San Juan, Puerto Rico, is on the phone for him. "I was expecting this phone call. I’m sure she just wants to tell me what a great job I’m doing," Baldwin’s Trump responds, seemingly unaware that the mayor delivered a frustrated critique of the federal response on Friday and pleaded for more federal aid in the aftermath of Hurricane Maria. Told that aid needed to arrive quicker, Baldwin's Trump says "well, you should have paid your bills. FEMA takes a few days unless you join FEMA Prime." "Ma'am, I don't know if you know this but you're in an island in the water, the ocean water, big ocean, with fishies and bubbles and turtles that bite," Baldwin's Trump says, parodying comments the president made on Friday. "We want to help you, but we have to take care of America first." Baldwin's Trump appears shocked to learn that Puerto Rico is a U.S. territory. President Trump on Saturday responded to the mayor's criticism of the federal response, tweeting that Carmen Yulín Cruz and others had "poor leadership ability" and that "They want everything to be done for them when it should be a community effort." "Weekend Update" co-host Colin Jost quipped, "Well, after President Trump was criticized for a terrible response to Hurricane Maria, this morning he finally gave the people of Puerto Rico what they needed most: A bunch of tweets straight up calling them lazy." Michael Che called on Trump to send Puerto Ricans more aid, telling him: “Go tell Melania to put on her flood heels, get some bottled water, some food, pack up some extra Atlanta Falcons Super Bowl T-shirts, and write them a check with our money, you cheap cracker." In the cold open, "SNL" also poked fun at the fallout from Trump's controversial comments about some NFL players' decision to kneel or sit during the national anthem in protest of what they say is police treatment of African-Americans and racial inequality. Players around the league kneeled or stood arm-in-arm last weekend in a gesture widely seen as a rebuke of the president's comments. "Well, you handled that NFL thing just great," Baldwin’s Trump says to Bryant's Sanders. "Well I'm a little bit embarrassed that I said it’s a black and white issue. I should have said it's a black versus white issue," she responds. Musical guest Jay Z wore a jersey with the name "Colin K" on the back, in an apparent reference to former San Francisco quarterback Colin Kaepernick, who started the protest last year. Kaepernick is currently an unsigned free agent. Ryan Gosling hosted for a second time as "SNL" kicked off its new season on Saturday. Last season was the show's most-watched in 24 years, according to NBC.